Dirt Doctor Weekly Newsletter - STOP WATERING SO MUCH! It’s probably a good time to remind everyone that irrigation systems need to be cut way back or cut off completely. 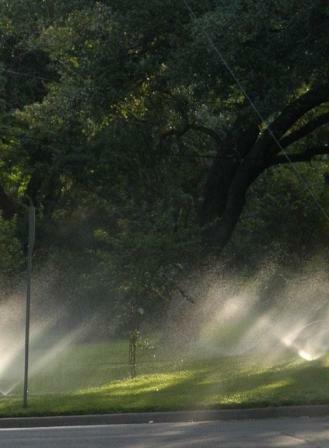 Several of my callers have indicated that they are still watering with the same schedule used in the summer. Not only is that a huge waste of water, but the plants are being injured. Once the temperatures cool, especially at night, moisture stays in the soil much longer. How often should you be watering now? I don’t know - it depends on your location, the soil, plant types, organic or synthetic program, etc. Hopefully you are organic and thus have lower water needs. Here’s the best plan. Turn the irrigation controller to manual. That way it won’t come on unless you push the button. You’ll save lots of water and your landscaping will look better. Technology can also help. Some cities require rain sensors which shut the sprinkler systems off. All cities need to do the same and enforce the rules. A rain sensor is a small device mounted in an open area outdoors and wired to the shutoff valve on the common line of the irrigation system. They are designed to override the sprinkler system after a rain, so you won't be watering wet soil. Florida is one of the few states with an overall rain sensor statute. HB 91, effective May 1, 1991, governing all new automatic sprinkler systems: "... shall install a rain sensor device or switch which will override the irrigation cycle of the sprinkler system when adequate rainfall has occurred." There is an override of the cycle until the rain sensor’s disks or water collection dishes dry out. The irrigation system’s timer will then come back online to the regular irrigation schedule. 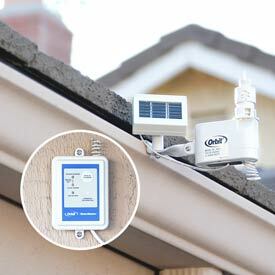 The rain sensor should be set to shut off the system when 1/4" of rainfall has occurred. Saves money – reducing water bills. Protects the plants and reduces disease issues. Again, it's best just to keep the system on manual and run it when the plants need water. You should also do hand watering as needed. That's what I do. If you have any questions on this newsletter or any other topic, join me for my local radio show in Dallas/Fort Worth on Saturday at 11am and my radio show heard across the country on Sunday from 8 - 11am (CST). Click here to find a station near you.